Your wedding day will be one of the most memorable and exciting days of of your life and we at Trolley Tours of Cleveland would like to be part of it! We provide services to over 200 weddings every year and we’ve seen almost 4,000 Brides in our 31 years of business! Our wedding parties appreciate both the festive air which Lolly the Trolley brings to a wedding and the wonderful personalities of our drivers who are there to assist the bridal party and guests. 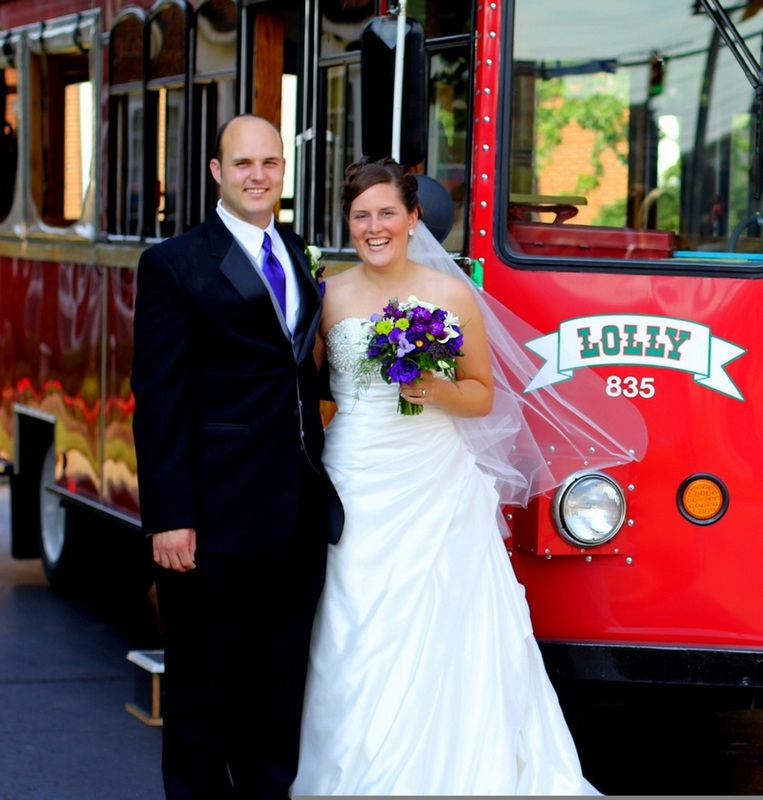 Let’s discuss just a few of the ways that Lolly the Trolley can make your wedding weekend even more memorable. Some of our clients have our festive red trolley meet the wedding party at the church at the conclusion of the ceremony. We transport the group to different locations for wedding photographs then proceed with the wedding party to the reception site. Other clients have the trolley pick up the groomsmen before the wedding and transport them to the church, then go to a 2nd location for the bride and bridesmaids. The trolley then waits at the church during the ceremony and afterwards transports the group for photographs with a final drop-off at the reception site. These ideas work especially well when the wedding and reception are several hours apart. ***One trolley comfortably carries up to 38 passengers…equivalent to 5 to 7 limousines…and is more economical to charter! Many of our clients have out of town guests who do not know their way around our city or its suburbs and they ask us to provide safe, dependable and courteous shuttle transportation between the hotels, church, and reception hall. It also allows us to serve as a “designated driver” for those attending the reception and we can be “on call” all evening for your guests. We are often asked to provide one of our nationally known City Sightseeing Tours as a special part of the weekend’s entertainment for your wedding guests. We can provide a privately chartered tour, or we can work with the person planning the wedding to provide information and reservations for our Public Tours, which depart from our station in Downtown Cleveland. Please see the tour information on this website for more information. 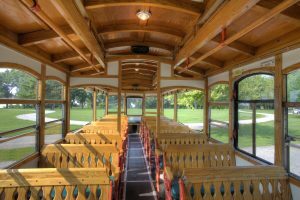 Trolley Tours can provide prompt and courteous transportation for the wedding party, relatives, and guests, during this special evening so that there is one less detail to worry about! PLEASE CALL TROLLEY TOURS AT (216) 771-4484 AND PRESS “0” TO SPEAK WITH A FRIENDLY PERSON WHO CAN HELP YOU!! How many people would this include in each case? Are you aware that we have a no alcohol policy for our vehicles? Our Vehicle Choices: Our trolleys can carry up to 38 people. We have 7 standard and 1 wheelchair accessible Lolly the Trolleys with windows in the front half and large open windows with roll down flaps in the rear. Although they are not air conditioned, we have found that the windows and open flaps keep the trolley totally comfortable on hot days when it is moving. Alcohol Policy: There is no eating, drinking or smoking allowed on the trolleys. There is to be no consumption of alcohol on board the trolleys and our drivers are instructed to follow company policy in enforcing our standards. A violation of the rules may require the driver to suspend the charter without refund for services not provided due to the violations. Trolley Tours has established a wholesome reputation over the last 31 years. We appreciate your cooperation in helping us maintain it! Your Itinerary: We like to receive your final itinerary no later than 2 weeks before your service date. Someone from our staff will call you approximately one week before your wedding to introduce him/herself, review your itinerary, and discuss any questions or concerns you may have about your charter service. Decorations: If you wish to decorate the trolley before your wedding we would be happy to work with you, if there are no charters before yours. Many of our wedding parties have the trolley arrive at the church 15 to 30 minutes before the ceremony has concluded, and friends quickly put bows or pom-poms on the outside of the trolley before everyone leaves the church. You may also put decorations inside the trolley. Please feel free to provide a “Just Married” sign for the back window. We do not permit rice, birdseed or confetti to be thrown at or taken on the trolley as they are very difficult to clean up and remain on the vehicles for many weeks afterward. We also ask that no shoes or tin cans be attached to the rear bumper of the trolley. Pictures: When you work with your photographer, be sure that the photographer decides in advance where you will be going and that he/she takes care of all applicable licenses, fees, permits and approvals that may be required. The photographer should be made aware of the time you have chartered the trolley and must work within that limited time frame. Additional Time: Be very aware of the time frame you choose for your trolley service. The ending time you designate on your contract is the time the driver plans to leave you and your guests at your final destination. It is highly likely that your trolley will be going directly to another private charter so that even a 15 minute variance may not be available.